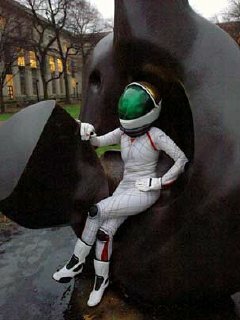 New space suits are being designed by MIT. Described as being reminiscent of Barbarella, they are figure hugging and use “‘mechanical counterpressure’ rather than gas to maintain Earth-like conditions for astronauts”. Professor Dava Newman is working on ‘BioSuits’ that will give the wear more freedom of movement than current spacesuits. The envisioned use for the suits is planet exploration, on the moon or Mars, where the bulk of current suits tires the wearing more quickly. But don’t expect to see these suits in use any time soon. Newman anticipates that they will be ready for use in about 10 years, in time for the manned expedition to Mars. This entry was posted in News, SciFi. Bookmark the permalink.